Have you seen Alexander and the Terrible, Horrible, No Good, Very Bad Day? Oh my goodness, it’s absolutely hilarious! We watched it last night as a family and really enjoyed it. I just love Steve Carell! In addition to spending some quality family time with my loves this weekend, Sunday afternoon I spent several hours prepping food for the upcoming week. I made hard boiled eggs for an easy protein-rich breakfast or snack, gluten-free banana bread with freshly milled buckwheat flour (recipe is part of a special project I’m working on, stay tuned! 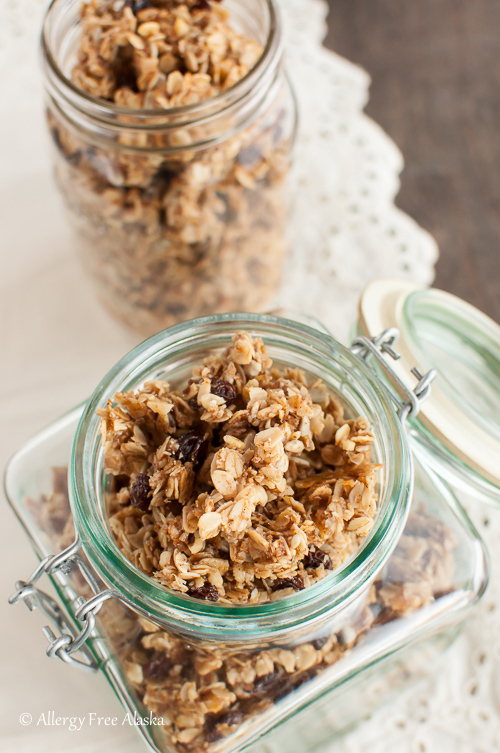 ), and flavorful Chai Spiced Honey Granola with Coconut Oil. 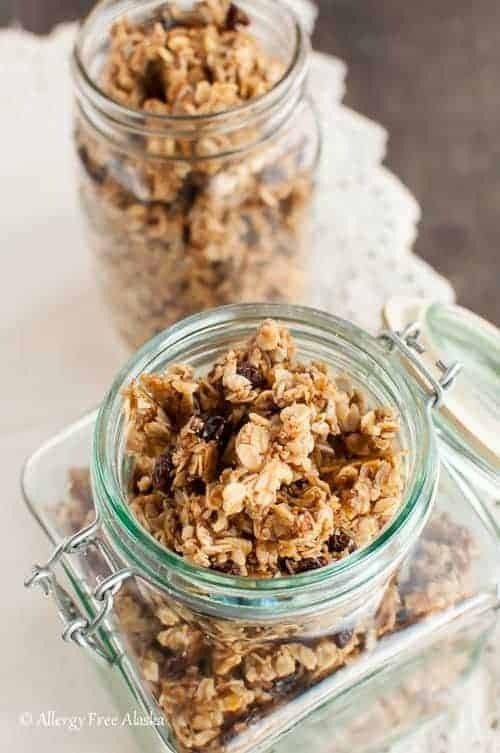 This delicious homemade granola is so handy to have in the pantry, and much, much healthier than any store bought granola. 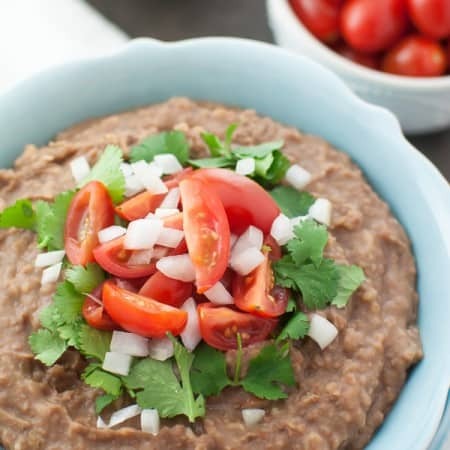 It is lightly spiced with the flavors of chai (cinnamon, cardamom, ginger, and cloves), sweetened with honey, and uses heart-healthy coconut oil. The aroma wafting from my kitchen as this bakes is undeniably pleasing. My girls enjoy it for breakfast in the morning with their favorite dairy-free rice milk, and the “clusters” act as a super convenient grab-and-go snack packed in these small glass jelly jars. We also enjoy topping our goat or coconut milk kefir with it, along with fresh or frozen berries. Preheat oven to 300 degrees (F) and line a large baking sheet with parchment paper or a silicone baking mat. 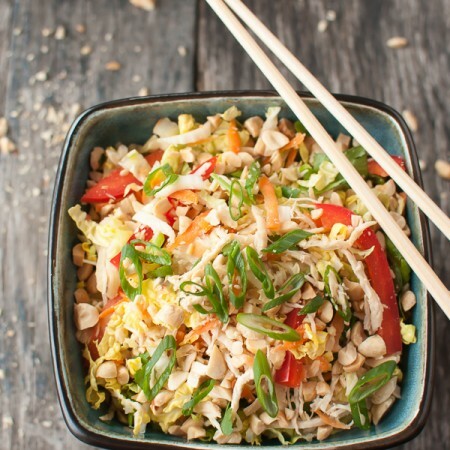 In a large mixing bowl, combine the gluten-free rolled oats, unsweetened shredded coconut, chopped nuts, raw sunflower seeds, palm sugar, cinnamon, cardamom, ginger, cloves and sea salt. Set aside. In a small saucepan over low heat, combine the coconut oil and honey. Mix until the ingredients are just melted. Add the vanilla extract. Pour the coconut oil mixture into the dry ingredients and stir together until just blended. Bake for 30-35 minutes, stirring once during the halfway mark, until the granola is golden brown and fragrant. Cool completely on the baking sheet, and then break into small pieces. 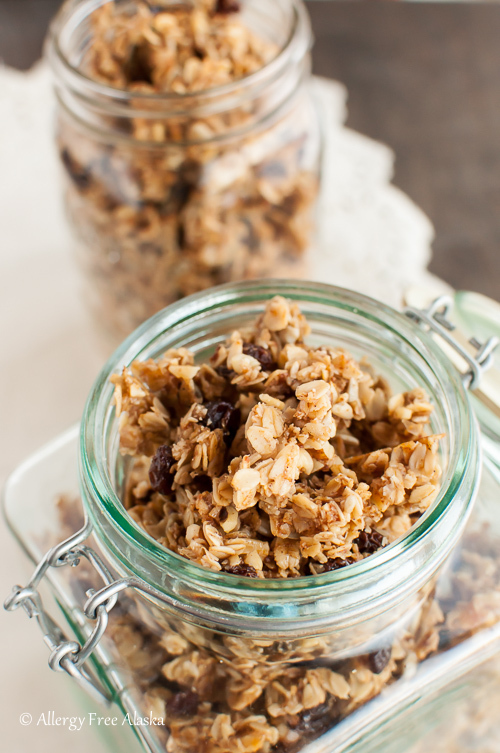 The granola may be sweet enough for you without the addition of the palm sugar. I add it only for my children. 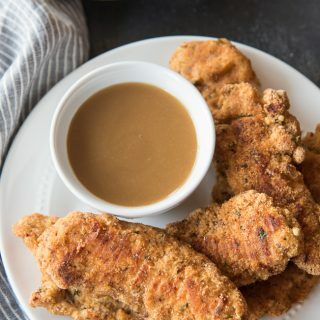 This post is linked to Savoring Saturdays, Saturday Night Fever, Tasty Tuesday, Talented Tuesday, You’re Gonna Love It Tuesday, Handmade Tuesdays, Fat Tuesday, Two Cup Tuesday, Allergy Free Wednesday, Gluten Free Wednesday, Homestead Blog Hop, Create It Thursday, Gluten Free Friday and Foodie Friday. I would love a handful of this granola right now, Megan! That’s my favorite way to eat granola, as a snack or for fuel while hiking, canoeing, etc. 🙂 Thanks for this yummy recipe, dear, and I must see that movie, too! This looks amazing but anything chai must be. I like to warm up my granola with some boiling water and eat it that way. Love that you cook the raisins in with the rest of the ingredients. I made a double batch and it is delish! You are right, the palm sugar is not neccessary. I cut back on the cardamom but the spices are very nice. I also added the coconut flakes and dried cranberries for the last 5 to 10 minutes as the coconut browns quickly and the cranberried have a tendancy to get hard and chewy. This is a keeper! Tilly, thank you so much for taking the time to come back and leave a comment with your thoughts and additions! 😉 Very happy to hear you enjoyed it! I just made this, and it’s delicious. Mine is overly-moist, though. Is it because it baked it all on one pan? The flavors are really good, and it was so easy to throw together.